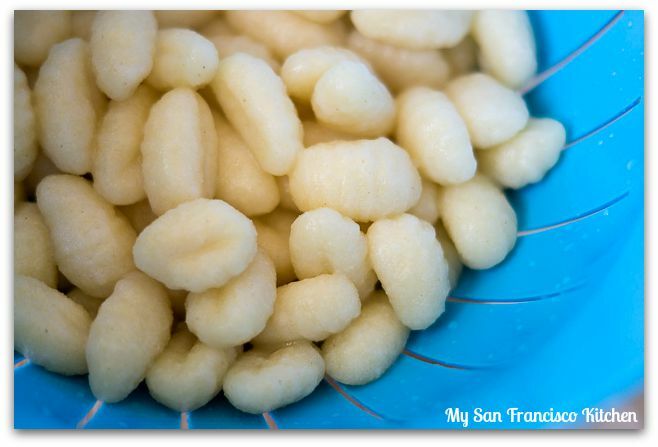 If you are new to gnocchi altogether, let me tell you a little about them. 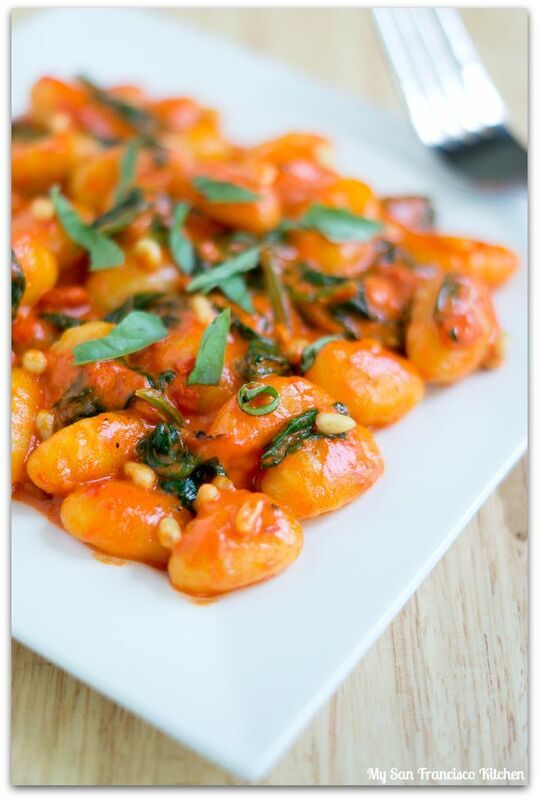 Gnocchi are little thick dumplings usually made of semolina or potato. Although they are considered to be an Italian dish, there are many variations made in different regions. In this recipe, I used potato gnocchi that was pre-made at the grocery store. You can find this in the pasta section. They are done in 3 minutes, which cuts down a lot of time for this recipe. If you are feeling adventurous, you can make your own homemade gnocchi from scratch. I have not attempted this myself, but I know that it is very time consuming (but also very rewarding!). Definitely worth it if you have the time! Traditionally, gnocchi is served with a melted butter or cream sauce. 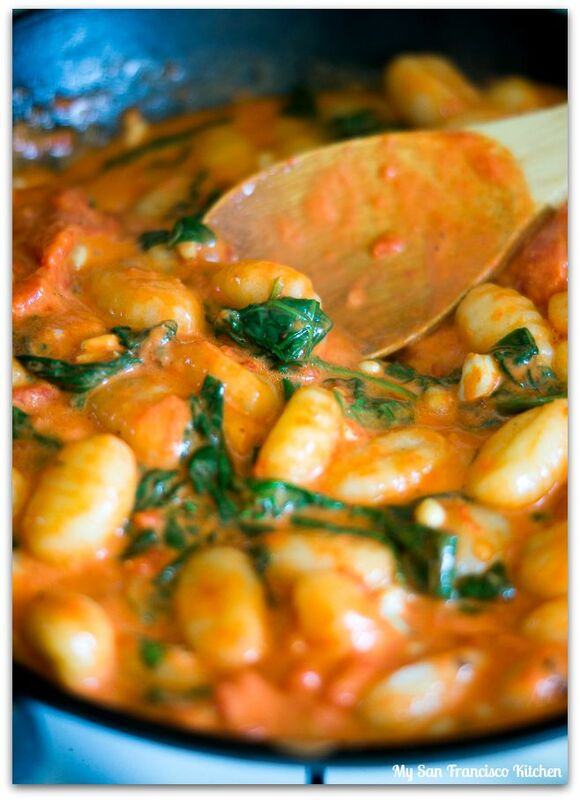 For this recipe, I tossed gnocchi, spinach and pine nuts in a garlic red roasted pepper sauce. 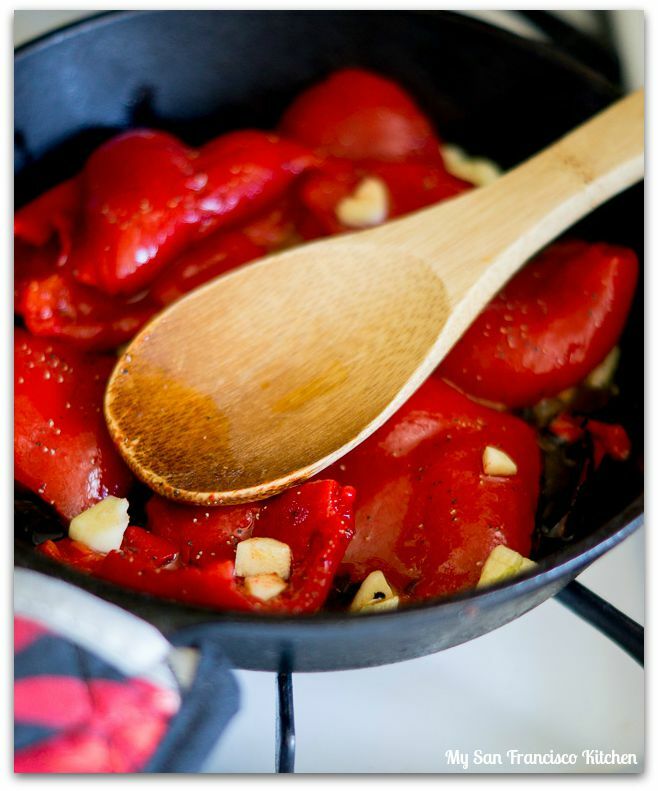 For the sauce, you will need a blender or food processor in order to purée the roasted red peppers. For an additional flavor, I like to top this dish with fresh shredded basil, which I think goes perfectly with the sweet pepper sauce. I love this recipe because it is very filling and satisfying for a vegetarian recipe! Heat the olive oil in a small sauce pan over medium heat and add the garlic. Mix occasionally for 4 minutes, until slightly browned. Add the red peppers and a little salt and pepper (you can add more later to taste) and stir well. Cook for another 4 minutes, stirring occasionally. Remove the pepper mixture from heat and allow it to cool to room temperature. 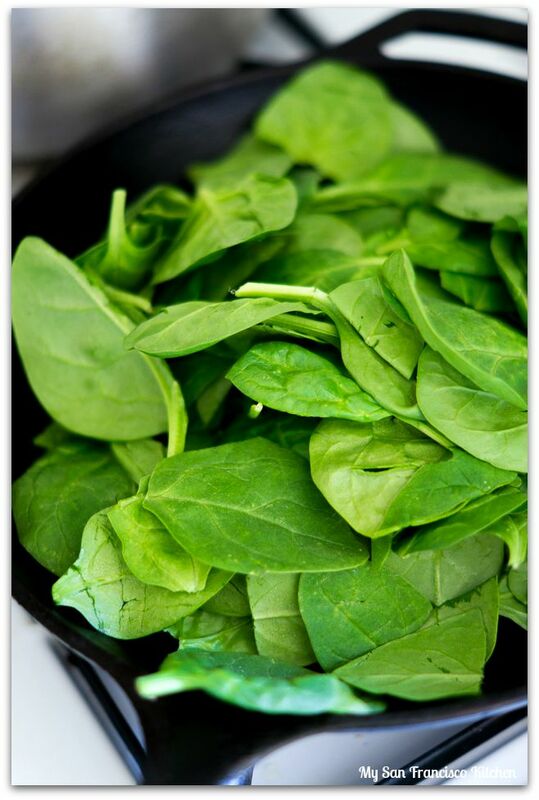 In the mean time, cook the spinach by wilting it in a tablespoon of heated water in a large skillet. Once wilted, turn the heat to low to keep warm. Bring salted water to boil and cook gnocchi according to package directions (mine said 3 minutes). Strain the gnocchi well, then transfer to the skillet with the spinach. Add some olive oil if desired and mix well. 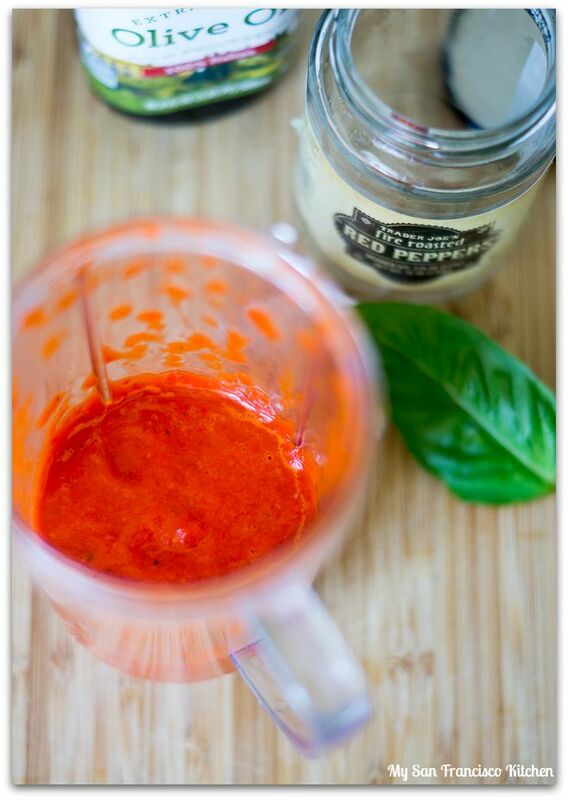 Transfer the red pepper mixture to a blender (once cooled to room temperature) and blend well. Add the roasted red pepper sauce back to the saucepan and heat through. Add the heavy cream and 1 tbsp basil and stir well. Transfer the sauce to the skillet with the gnocchi and stir and heat through. Serve warm topped with the rest of the shredded basil. 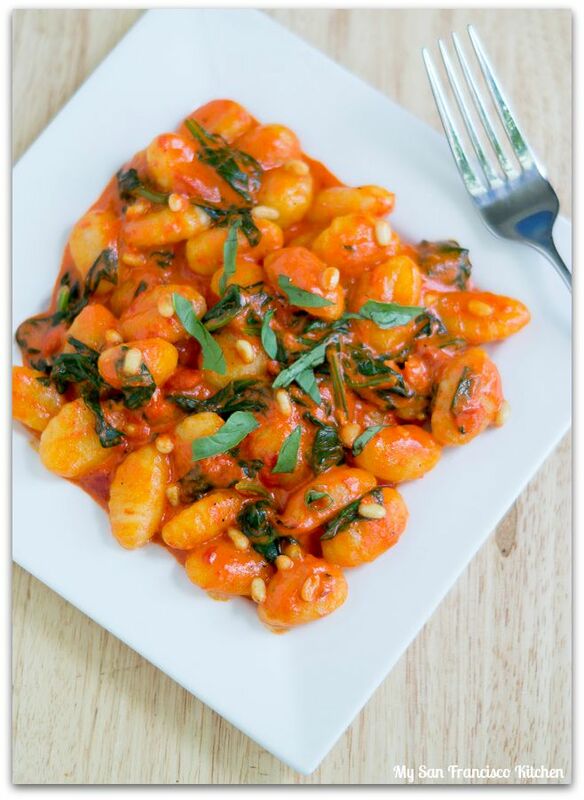 This entry was posted in Dinner, Italian, Lunch, Vegetarian and tagged gnocchi, pine nuts, red bell pepper, spinach. I love gnocchi! And what a great sauce for it. I haven’t made gnocchi for several years — it does time a bit of time, as you say, but it’s so worth it. This looks great — thanks. Beautiful recipe and easy to veganize, thanks! 🙂 Gnocchi is one of hubby’s favorites.